If you have been keeping up with Domestically Blissful on Instagram or if you saw last Thursday’s recipe for Watermelon Syrup then you know that this last weekend was the World’s Longest Yard Sale! I hadn’t been to the yard sale since the summer before we got married – 2011 – and I had been a little over eager for the sale, which unfortunately did lead to some disappointment. There was so much predicted rain and scattered showers that many vendors did not bring out all of their treasures – furniture – to sell. 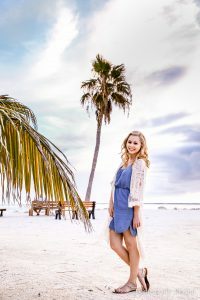 The last time we went we had been preparing for a wedding (even though we weren’t technically engaged yet) and we found so many wonderful treasures and incredible deals that have doubled as wedding decor and home decor. So naturally I had extremely high expectations. Although I did buy many little items here and there I didn’t find any of the big items I was looking for, which I am going to blame on the weather. Oh well, better luck next year! Plus there is always the US 11 Antique Alley Yard Sale in May to look forward to! Ok, enough yard sale talk! 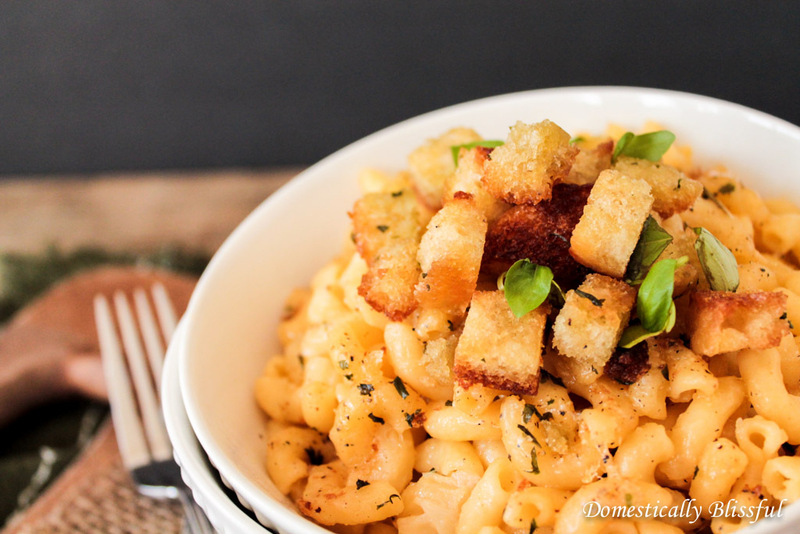 I know you are really here for this mouthwatering Roasted Garlic Macaroni and Cheese recipe! I have a special love for garlic. Even though it doesn’t make a good kissing ingredient it does make for happy tastebuds! My husband always protests when I start adding lots of garlic to something, but once he tastes it he always asks for more! Now of course if you are worried about having too strong of a garlic taste you can always choose a smaller head of garlic for this recipe, but honestly I love garlic so I prefer a large head of garlic. Of course if you are not a fan of one of the above cheeses you can always switch it out for your favorite or whatever you have on hand. First, preheat your oven to 400° and place a medium piece of foil on a baking sheet. Cut off the top 1/3 of the head of garlic, place the garlic on the foil, and drizzle on the 1 teaspoon extra virgin olive oil. If the garlic head is large you will need 2 teaspoons of oil instead of 1 teaspoon. Place the garlic head back on top, wrap the foil up around it and bake for 20 minutes. For the first 15 minutes keep it wrapped, but for the last five minutes unwrap the foil and flip the top off – garlic facing up – to bake for the last 5 minutes uncovered. This is the perfect time for you to work on the breadcrumbs! In a medium sized bowl mix together the 1/4 heaping cup of extra virgin olive oil, a pinch of salt and pepper, and 1 teaspoon dried parsley flakes. Then fold in the 1 & 1/2 cups diced bread – I prefer smaller breadcrumbs so I diced the bread into small to medium sized pieces – and set to the side. While the garlic is still baking start boiling your water and cook the 2 cups of pasta according to the packing directions. 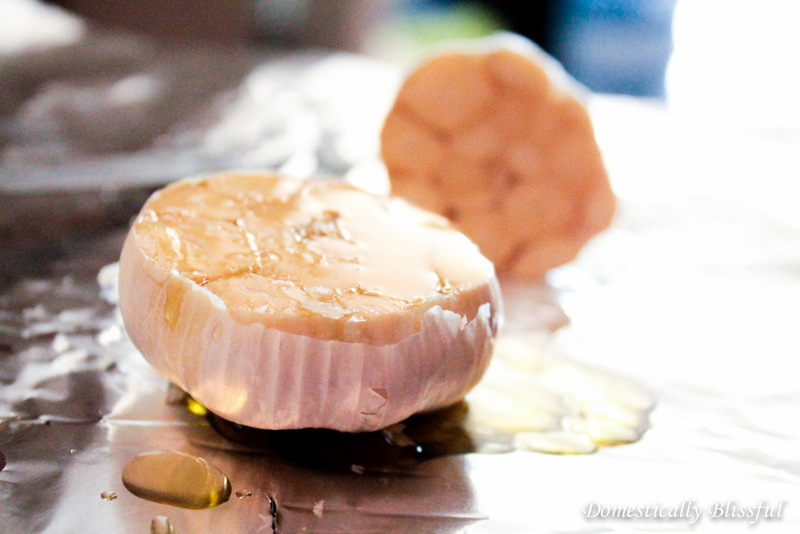 Once the garlic is done baking, remove the foil/garlic from the pan and let cool until cool enough to touch. Then squeeze the garlic cloves out onto a plate and mash the cloves with a fork. The garlic cloves should be baked through and will easily slide out. If you want chunks of garlic in your Roasted Garlic Macaroni and Cheese you don’t have to mash all of the cloves completely. Once mashed set to the side for later use. Reline your baking sheet with a new piece of foil – if your last one is too small or unusable – and place the breadcrumbs on the sheet. Bake at 400° until golden brown – about 3-5 minutes – then remove from the oven and set to the side for later use. Once the pasta is cooked al dente, drain and return the pasta to the pot. Then mix in 2 tablespoons butter, the mashed garlic, 1/2 cup mixed cheese, 1/2 cup shredded Colby cheese, 1/4 heaping cup half & half, 1/4 cup milk, 1 teaspoon salt, and 1 teaspoon pepper. 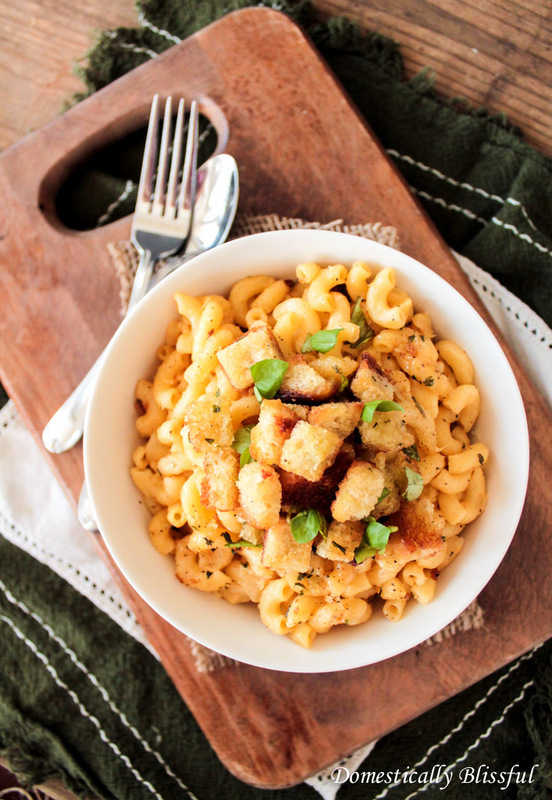 Poor the macaroni and cheese into a baking dish – ours is about 10×7 and oval – and top it off with 1/4 cup parmesan cheese and a sprinkling of salt, pepper, and garlic powder. 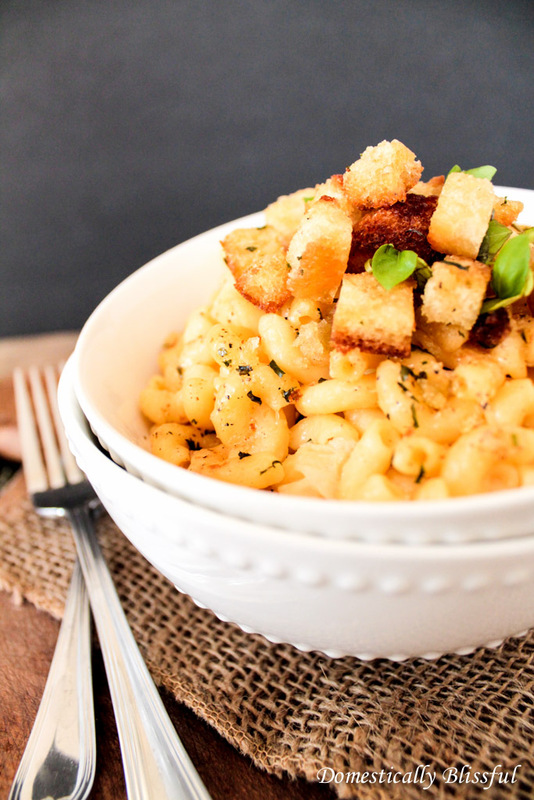 Bake the Roasted Garlic Macaroni and Cheese for 12-15 minutes at 400° and in the last 3 minutes of baking add the breadcrumbs to the dish to reheat them. Although I must admit I enjoy snacking on them while the macaroni and cheese bakes! 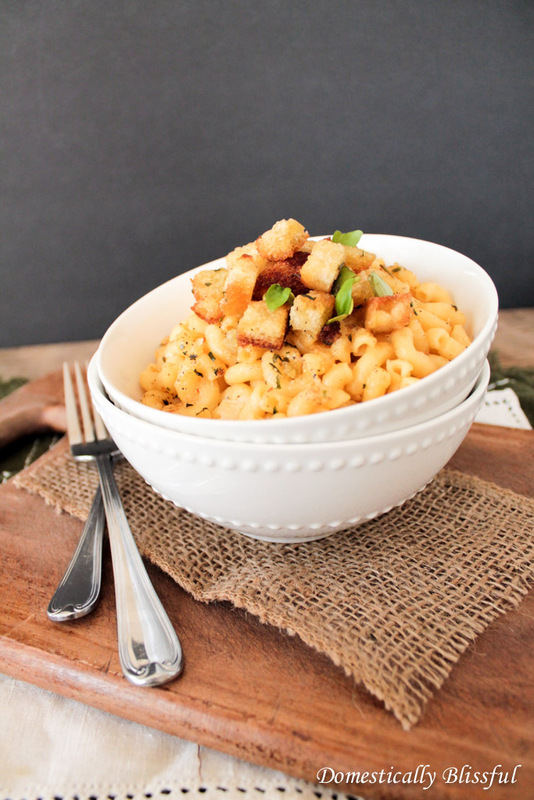 Serve the Roasted Garlic and Macaroni and Cheese with your favorite vegetables and enjoy! 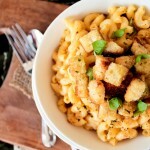 This is the perfect time for you to work on the breadcrumbs! In a medium sized bowl mix together the 1/4 heaping cup of extra virgin olive oil, a pinch of salt and pepper, and 1 teaspoon dried parsley flakes. Then fold in the 1 & 1/2 cups diced bread and set to the side. Once the garlic is done baking, remove the foil/garlic from the pan and let cool until cool enough to touch. Then squeeze the garlic cloves out onto a plate and mash the cloves with a fork. Once mashed set to the side for later use. 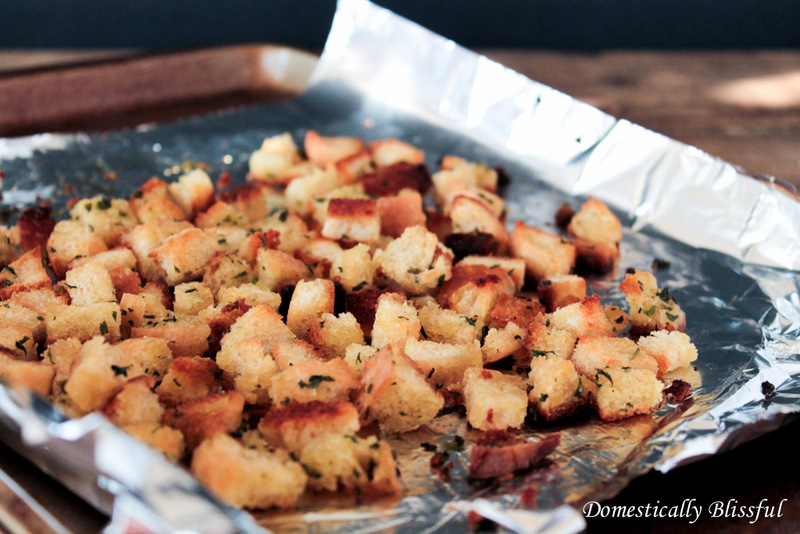 Reline your baking sheet with a new piece of foil and place the breadcrumbs on the sheet. Bake at 400° until golden brown – about 3-5 minutes – then remove from the oven and set to the side for later use. Once the pasta is cooked al dente, drain, and return the pasta to the pot. 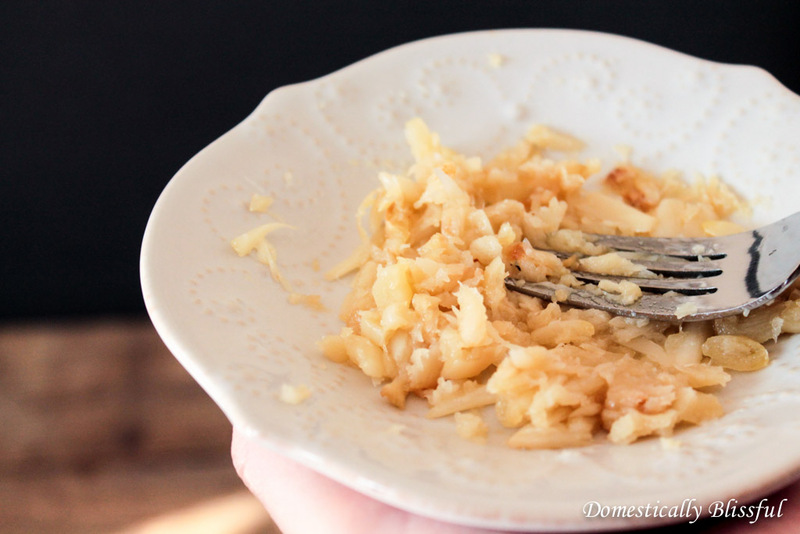 Then mix in 2 tablespoons butter, the mashed garlic, 1/2 cup mixed cheese, 1/2 cup shredded Colby cheese, 1/4 heaping cup half & half, 1/4 cup milk, 1 teaspoon salt, and 1 teaspoon pepper. 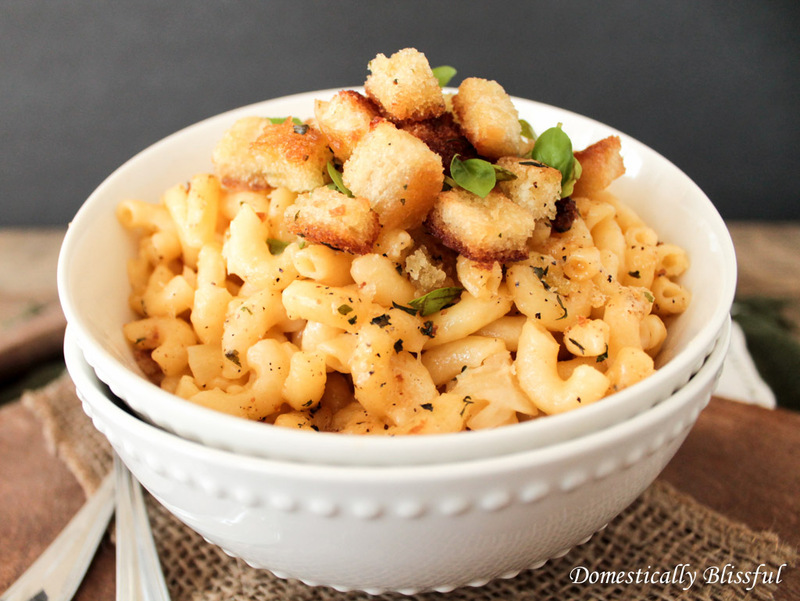 Poor the macaroni and cheese into a baking dish and top it off with 1/4 cup parmesan cheese and a sprinkling of salt, pepper, and garlic powder. 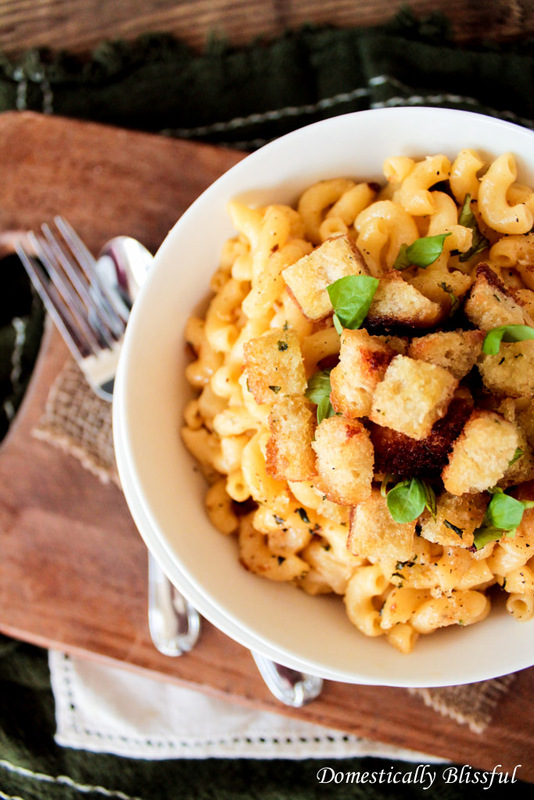 Bake the Roasted Garlic Macaroni and Cheese for 12-15 minutes at 400° and in the last 3 minutes of baking add the breadcrumbs to the dish. If you want chunks of garlic in your Roasted Garlic Macaroni and Cheese you don’t have to mash all of the cloves completely. Our baking dish is about 10×7 and oval.